Yo! What's the haps? : A slightly selfish Christmas gift. THE SNOOPY SNO CONE MACHINE!!!!!!!!!!!! Oh yes, it is real. It is sitting in my house right now. This thing is worth its weight in gold, I tell you. It provided me with so much amusement as a child... I can't imagine any kid NOT loving it. 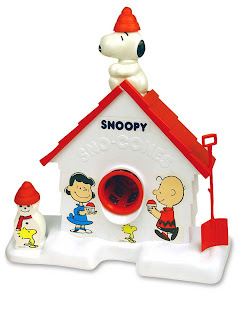 I completely forgot about the Snoopy Sno-Cone machine---my sister and I had one too! I loved that thing. I can taste the sno-cones as I type! AMAZING!!! Get thee to Winners and snap one up! It is so awesome.